There's a lot to love about Chez Cthulhu. The Chez line in general has great art and jokes layered with quick, fun-to-play mechanics. 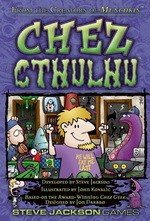 But Chez Cthulhu takes all that goodness and adds everyone's favorite Lovecraftian tropes, to create either an unholy monster or a perfect blend of game and theme. Given that we've moved over a third of the print run in less than a month, I'm guessing most of you would say "perfect blend."